A national Employer-Iron Worker safety committee that monitors, testifies and confers with OSHA on existing and proposed regulations. A national training program that conducts an annual school for Iron Worker instructors in Michigan. opportunities and market share for Iron Workers and their employers. We also conduct ongoing training programs and produce training videos, both solo and in partnership with the International Association of Bridge, Structural, Ornamental and Reinforcing Iron Workers and its local unions. and forge strong friendships and business relationships that grow year by year. 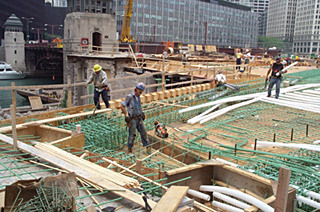 NARSC moves the reinforcing steel and post-tensioning industries ahead. Inside the industry, we champion advances in safety and appropriate certifications to ensure good working conditions, high morale and excellence on the job. On the broad scene, we maintain contacts with the media to enhance the public perception of the industry. And for our members, we promote networking opportunities that allow contractors to learn from each others successes.